The miniseries Requiem premieres March 23rd on Netflix. Following the recent success of Channel Zero and The Exorcist, the horror genre has enjoyed a resurgence on TV in recent years. So, when BBC recently announced the arrival of a new horror thriller involving the supernatural, the idea certainly piqued interest. For a company specializing in crime dramas and murder mysteries, on the surface Requiem seems like a bold, new direction for the company. With six episodes at an hour each, there’s enough time given to flesh out the characters and for the first 15/20 minutes there’s a lot of good work done to set the chilling tone, even if it is a little cliché riddled at times. Unfortunately, Requiem shrugs off its horror shackles after the first episode and instead embraces a murder mystery angle spanning the duration of the show. There’s little in the way of horror here and although the mystery itself is gripping enough to sustain your attention, there’s nothing particularly original that hasn’t been done more effectively elsewhere. For a show bragging to be the scariest BBC have ever produced, there’s a real lack of horror for most of the series. The first five minutes open much like other horror shows, with an introduction into the supernatural elements and an untimely demise for a poor individual caught up in the whirlwind of spirits haunting the property. From here, the story cuts to our main protagonist, Cello star Matilda Gray (Lydia Wilson). When her mother commits suicide in front of her, Matilda wonders whether this is linked to the disappearance of a little girl from a Welsh village in 1994. We get our answer at the end of the first episode in a questionable reveal that destroys most of the momentum going into this. 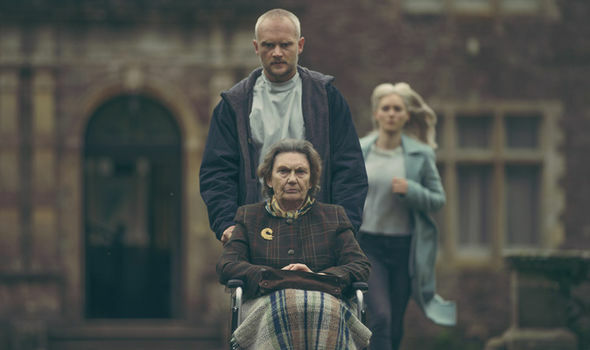 As the series progresses we learn exactly what happened to the little girl Carys and more about this Welsh town as Matilda and her friend Hal (Joel Fry) stay at the same house we see at the beginning of the first episode, uncovering the mystery surrounding the property. Whilst the mystery itself is okay, there’s a profound lack of horror throughout the show. There are moments scattered through the six episodes used to remind you this is still technically a horror, but these moments are so sporadically placed and infrequent they lose their effectiveness. Whilst this might sound odd considering less is sometimes more when it comes to horror, the scares feel like a cheap tactic when many of the latter episodes lose the aura of dread and tension evident in the first episode. There’s certainly moments that stand out though; one particular scene showing Matilda in the shower is genuinely unnerving and a few of the dream sequences have some disturbing imagery but most of the series is swallowed up by the mystery that isn’t gripping enough to carry the show through its six-hour run time. If you can go into Requiem and ignore the critics calling this the “scariest TV show ever”, you may well find some enjoyment here. Requiem is a far cry from the high standard set by other horror shows including The Exorcist, Channel Zero and even Fear the Walking Dead’s latest season. The acting is stellar throughout though and if there’s one thing BBC dramas excel at it’s this. The mystery is well paced for the most part although the questionable reveal at the end of the first episode does halt a lot of the momentum the show had going for it until that moment. Coupled with a profound lack of scares, Requiem is best enjoyed as the show it should have been marketed as – a murder mystery with a hint of the supernatural. Requiem is not scary, nor is it particularly great, but there’s enough here to pique interest and carry you through to the final scenes even if the ride to get there, isn’t quite as gripping as it should be. I give Requiem a C+.